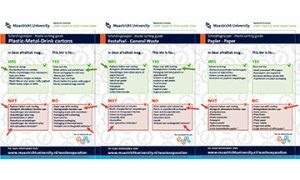 As you may have noticed, all faculty waste bin locations now carry waste sorting information sheets. These sheets provide the guidelines concerning the latest UM waste sorting standards. By own initiative, the Faculty Green Impact team -FASoS Soylent Green- took care of adjusting and distributing the new waste sorting information guidelines. FASoS is hereby the first UM faculty and overall location, that applies the most recent and correct guidelines. Metal and drink cartons go in the ‘plastics’ bin. Bandito biodegradable and other paper cups with coating, go in the general waste bin. Pizza boxes go in the general waste bin. Non-rechargable batteries go in the battery collection box, a blue plastic box next to the reception desk.